Ask the internet “who invented mayonnaise?” and likely as not you’ll still be told it was a French chef after the battle of Mahon in 1756. Lacking cream, he whipped up an emulsion of egg yolks, oil and vinegar. How that was supposed to substitute for cream, history does not record. But then, history does not record the actual event either. It’s fake news of the finest kind. Tom Nealon sets the record as straight as possible in his book Food Fights and Culture Wars. We talked about mayonnaise on the show, but when I asked Tom for his favourite story, that wasn’t it. This was. 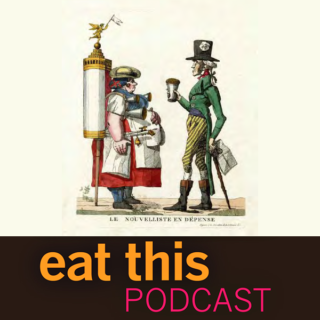 Original episode: Mistaken about mayonnaise — and many other foods. Well, that was wonderful!!! Especially since I just harvested 300 lemons from our tree in Collioure.! Thank you. No plague around here. I’ll link this interview to livingwithloulou.com on her lemon blog two days ago and see who salutes. ABAA Rare Books mentioned this article on twitter.com. yellowdoorhouse liked this article on twitter.com. yellowdoorhouse reposted this article on twitter.com. Tom Nealon liked this article on twitter.com. Tom Nealon reposted this article on twitter.com. Tom Nealon on the plague-stopping power of lemonade.